Is it too early for Christmas quotes? Nah, after Starbucks releases their holiday cups, it’s fair game. Balms are a multi-purpose skin care product and there’s no better time for them to shine than winter. In general, balms are oil-based and can act as cleansers, nourishing masks, protection against windburn (great for protecting your skin during winter activities like skiing and snowboarding), and as a treatment for dry knuckles, cuticles and lips. They’re also beneficial if you have rosacea or eczema because of their super-hydrating qualities. I love Beautycounter’s best-selling Cleansing Balm because it doesn’t strip away moisture and features vitamin C, mango seed butter and cranberry seed oil to hydrate and provide antioxidants (Read more in this post). I’m also a fan of skoah’s face balm — It healed a patch of rough, dry skin I had one year! … because it’s your new best friend! Hyaluronic Acid (Don’t let the acid part fool you) is a skin care ingredient equivalent to a super food. It is a glycosaminoglycan that is actually a natural substance in your skin. Hyaluronic acid holds 1000 times its weight in water making it a must-have for dehydrated skin. It comes in two forms: hyaluronic acid and a derivative — sodium hyaluronate, a more easily absorbable type. Look for products with both for double the benefits, which include brighter, plumper and more hydrated skin. My favourite hyaluronic acid products are Beautycounter’s Countermatch Intensive Serum (Has both forms of HA), skoah’s hydradew mask and The Ordinary’s “Buffet” serum. If you want to keep your skin in tip-top shape, you have to exfoliate. There’s no ifs ands or buts about it. Exfoliation clears dead skin cells from the surface of your skin so the products you’re layering on don’t have to pass through them to reach the healthy skin cells they’re targeting. If you’re not exfoliating regularly, you’re wasting product and not reaping the benefits of it. I exfoliate 2-3 times per week. When searching for an exfoliator, there are two types to consider: Manual or Chemical. These words sound scary, but they’re not. A manual exfoliator means a scrub or beads that you need to rub into your skin to work (good for normal skin types with no major issues). Try Just Naturally Living’s Lavender Green Tea Face Scrub. Although I love that face scrub, I do prefer chemical exfoliators which dissolve dead skin cells with alpha hydroxy acids (Often derived from fruits), lactic acid, glycolic acid or salicylic acid for most skin types. They are less irritating and less damaging to your skin. My favourites include Beautycounter’s No. 3 Balancing Mask (Charcoal and salicylic acid), Pixi’s Glow Tonic (Glycolic acid) and The Ordinary’s Lactic Acid 5% (Also has hyaluronic acid!). After you’ve cleansed, exfoliated and plumped your skin with hyaluronic acid, it’s time to seal in all the hydration you’ve just boosted your skin with! Step one: A face oil. These repair your skin’s moisture barrier, help prevent water loss and infuse your skin with antioxidants. 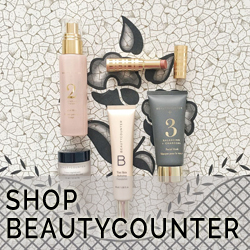 I like Beautycounter’s No. 1 Brightening Oil (Seven natural oils plus marula oil and vitamin C), Loa’s Miracle Oil (A blend of four oils), and Ole Henriksen’s Pure Truth Youth Activating Oil (Rosehip fruit oil). Step two (You guessed it! ): Moisturizer! Nowadays, moisturizers are jam packed with nourishing ingredients including oils, hyaluronic acid and antioxidants. So, you can double up and lock in the moisture all-in-one. Right now, I’m a big fan of Beautycounter’s Countermatch Recovery Sleeping Cream (Hyaluronic acid and plum oil) and Youth to the People’s Age Prevention Cream (Hyaluronic acid and antioxidants from kale, spinach and green tea). Both of these are great winter moisturizers. 5) Don’t forget the SPF! Just because the temperatures are below freezing, doesn’t mean the sun isn’t shining. Snow will reflect sunrays back onto your face and any other exposed skin. You need to be wearing an SPF of at least 30, 365 days a year to prevent early signs of aging and, of course, skin cancer. Do I have to remind you of the golden SPF rule? Reapply, reapply, reapply! If you’re active, reapply every 2-3 hours or if you’re sitting in an office, reapply at lunch — especially if you sit near a window. At the moment, I’m alternating between two daytime moisturizers with SPF: Cetaphil’s Daily Facial Moisturizer SPF 50 and Rodan + Field’s Triple Defense Treatment SPF 30. Want more skin tips, tricks and secrets? Sign up for A Lush Life’s Nourish Your Skin November.